MANOA has published many stories, poems, and essays about the ethical imagination and reconciliation. With this blog, we hope to bring these to readers’ attention and discuss events that are related to our work. “The ice is melting in the north,” writes Oren Lyons, Faithkeeper, Turtle Clan, Onanadaga Nation, in an oration to world leaders that begins this collection. His words are a call for humanity to heal a wound in our relationship to the natural world. They are also a powerful metaphor expressing the fragility and uncertainty of the future in general — the result of global declines in justice, equality, and civility. In this collection, the editors turn to some of the world’s most thoughtful authors — in fiction, essay, poetry, drama, and parable — to ask important questions about the future, to give us moral direction, individual courage, and a map toward reconciliation. In many voices and dialects, they urge us to be attentive and compassionate — somehow, as guest editor Barry Lopez writes, to bring hope to bear on the things that confound us. Someone will have to make an outline, draw a map and pass it around, with a pencil and an eraser and no thought of ownership. The voices of individual authorship and the duly elected will need to give way to the repositories of community wisdom. For the first time in centuries, wisdom will need to be seated beside intelligence, a second light to cut the deep and unknowable dark. Among the contributors to Maps of Reconciliation are the playwright Catherine Filloux; poets Kazuko Shiraishi, Ann Hunkins, Chris Merrill, and Luis H. Francia; fiction writers Yan Lianke, Tony Birch, Wang Ping, Prafulla Roy, and Galsan Tschinag; and nonfiction writers Julia Martin, Wayne Karlin, and Alberto Manguel. Translators include Chen Zeping, Karen Gernant, John Hood, Katharina Rout, and Yumiko Tsumura. Three dramatic portfolios by photographer Franco Salmoiraghi depict exemplary struggles for reconciliation in Native Hawaiian culture. Accompanying the photographs are short prose pieces by Meleanna Aluli Meyer, John Keolamaka‘ainana Lake, and Mahealani Perez-Wendt. The issue also includes images from the notebook of Hoang Ngoc Dam, a young Vietnamese medic who is one of the subjects of “Wandering Souls.” This nonfiction piece by Karlin recounts the journey of Homer Steedly from his days as an American soldier in Viet Nam to self-awareness, discovery, and forgiveness. In this collection of essays, fiction, and poetry set in South America, Europe, Australia, the Middle East, Asia, the United States, and elsewhere, a diverse group of writers explores the role of literature in confronting the most pressing issue of our time: how individuals, communities, and nations can reconcile differences and grievances and forge a future with a renewed sense of dignity and mutual respect. Contributors to this volume are John Luther Adams, Aku Wuwu, Margaret Atwood, Christopher Cokinos, Jorge Edwards, Hwang Sun-Won, Barry Lopez, Taha Muhammad Ali, Alexis Nelson, Lydia Peelle, Samih al-Qasim, Santiago Roncagliolo, Davide Sapienza, Aharon Shabtai, Rebecca Solnit, Sasson Somekh, Lysley Tenorio, and Mark Tredinnick. Translators are Mark Bender, Peter Cole, Yahya Hijazi, Nazih Kassis, Peter H. Lee, Gabriel Levin, Laura Ponce, and William Tydeman. Linda Connor contributes photographs of sacred sites around the world, and Kate Joyce an essay and selections from her “Threshold of Human Touch” project. 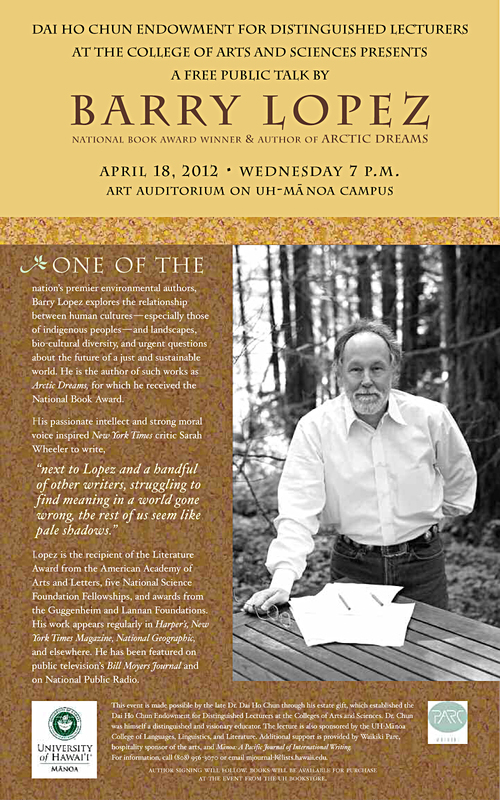 Below is the flyer for Lopez’s April talk.